The World Methodist Council received word on 19th October of the untimely death of Bishop Dr. Taranath Sugnanam Sagar, Senior Bishop of the Methodist Church in India and President of the National Council of Churches in India (NCCI). 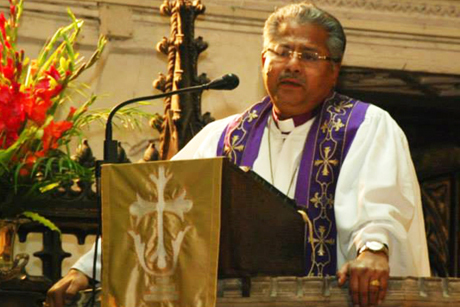 Bishop Sagar suffered a heart attack, and his passing has shocked many in the global ecumenical community. Bishop Sagar is described by the Church of South India as “one of the tall ecumenical leaders from India who was a proponent of wider ecumenism. [He] worked diligently for that goal during the past three decades through various ecumenical and ecclesiastical organisations in India, Asia and at the global levels. He was president of the National Council of Churches (NCCI) for two consecutive terms, was a member of the executive committee of the Christian Conference of Asia and president of the Asian Methodist Bishops Conference. At the World Council of Churches, Bishop Sagar played a key role as a member of the working group that helped in recent years to revise the WCC constitution and rules. Bishop Sagar served on the World Methodist Council as a member of the Ecumenical Relationships Standing Committee and was an advocate for on-going dialogue between the WMC and other Christian faith traditions. On behalf of the World Methodist Council and its member churches, we wish to express our condolences to the Methodist Church in India and to Bishop Sagar’s wife, Mrs Padma Sagar, and his son and daughter and their families.